Lubenham lies on the A4304 two miles to the west of Market Harborough in South Leicestershire which, even with the main road and proximity of a large market town, has managed to retain its rural identity. It has a long history with archaeological finds in the area dating from the Bronze Age, Roman and Anglo Saxon periods. Developing around a shallow crossing over the River Welland, Lubenham or Lubenho was mentioned in the Domesday Book when the population was recorded as 45. By the early 14th century, the village had secured permission to hold two weekly markets and an annual fair at Whitsuntide. All Saints Church is first mentioned in 1109 although the earliest part of the present Grade 1 listed building dates from around 1150 and almost certainly replaced an earlier, possibly, wooden structure. 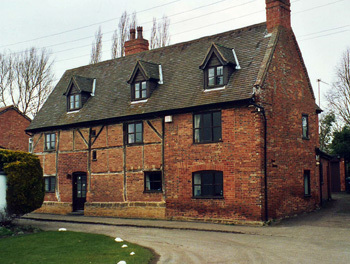 Several medium-sized houses dating from the beginning of the 17th century onwards probably reflect the number of freeholders with small estates which followed the early enclosure of open fields in 1600-1 and later in 1766. Situated on the rich fertile grazing land of the Welland Valley, agriculture and associated trades were the staple occupations but during the 19th century a thriving industry developed with the opening of Victoria Mills, a factory making carriage and livery lace trimmings which were sold to the foremost railway companies both here and abroad. The railway station opened in 1869 and closed nearly 100 years later. The village has a rich history associated with hunting and horse racing to which many of the houses owe their existence. It was in Lubenham in 1860 that the famous National Hunt Chase, now part of the annual Cheltenham Festival, was born and the area has been home to many famous racehorses including Brown Jack and Alcibiade. Today Lubenham is a thriving village. The impressive range of active village organisations, a testament to its community spirit, includes the well-known Scarecrow Festival held every September which raises money for local charities and groups.